Would you like to be able to make sure things get done on time without rushing or over-managing your children? How about putting perfectionism aside and providing guidance without criticism or negative correction? Here are the 7 suggestions that I shared with readers of Rachel Macy Stafford's powerful Hands Free Mama blog at her request in the comments section of her post "The Manager In My Home..."
1. CHECK IN WITH YOURSELF—For concerns about rushing, first check your own comfort level with schedules. Personally I hated them. I was rushed as a child and always wished I could do things in my own time. Deadlines seemed stupid and unfair. Hearing “Take your time,” would have been "Soul-Building" for me as Rachel says in her post. Fast-forward to an adult in charge of time boundaries for my children, and you can see why I’d feel angry, upset and powerless when any deadline approached—regardless of the technique I tried for getting my kids out the door. Deadlines got much easier when I finally recognized and validated my childhood feelings about schedules and theirs. Suddenly I could see schedules as just a tool that can help you meet up with people and get things done. 2. CHECK YOUR BOUNDARY—Children respond to boundaries that are OK with you and resist boundaries that for one reason or another are not (like mine and making kids be on time). To see what I mean, think of a boundary that is OK with you, like wearing clothes in public. That’s just what people do, and you are fine with that (probably?). If so, you don’t “ask” children to comply (which suggests they can say no) or ask "OK?" (which suggests you need their permission). You simply state your boundary as a matter of fact: "People wear clothes outside." On-time is the same thing. You don’t apologize for your boundary, defend it, give lots of reasons for it, or feel bad about holding firm on it. Kids can tell the difference. When a boundary is OK with you, they may grumble a little at first, but when their grumbling doesn’t trouble you or get you to change the boundary, they very quickly adapt and it becomes just what they do, too, without a struggle. This is true for ALL boundaries. 4. USE YOUR CHILD’S SOLUTIONS—For children 3 and up, if stopping and smelling the roses is important to your child, let him/her suggest solutions for fitting that in. Then try them, point out what worked, consider what problems still need to be solved, brainstorm again, and tweak the solutions until they work. When your child experiences success you can point out the strength: time management, planning, or self-direction, etc. Children learn best by success. 5. OFFER FUN CHOICES—For little ones, when getting to the car is a struggle, my grown daughter Betsy offers these choices: “You can walk, run, or fly.” Piggy back is another option that usually brings a smile. The options are endless, and adding the element of “fun” make everyone’s morning more connective. 6. SUCCESS TRAINING—The other thing I want to emphasize is Rachel’s suggestion in her post to notice every positive thing your child is doing toward the goal of task completion and describe objectively what is not yet done, not as a criticism or negative correction. Then when the task is done, I go on to celebrate the child’s success and point out the child’s strengths. Your child will feel empowered and much more able to cooperate as Rachel demonstrated, plus it’s exactly the way to help children master difficult tasks without over-management. If she misses one, you just describe the location and let her be the one to figure out that she missed it and solve the problem herself as in, “You got that one and that one. Look right there. There’s one more hiding,” or “That tooth has a back side, too,” etc. By focusing on her successes, giving her information, and letting her solve the problem herself, she will feel empowered all the way through, and will probably be more willing to let you help when needed. It’s natural to manage children when you think that they will fail. Success training gives you proof they won’t. When you see your child’s mastery improve, it’s easy to back off from managing every detail. 7. 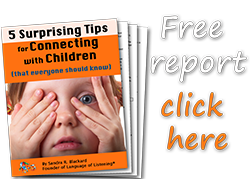 MORE—I explain exactly how to use 3 simple coaching skills to validate without agreeing, see the child’s perspective, set clear, clean boundaries, point out strengths to help children change their own behaviors and much more in my little online book SAY WHAT YOU SEE. You can read it free on my website (now in mobile-friendly sliders!) or take my online video classes to learn even more.